It is tempting to use religion to help us feel better about ourselves. Too often, we want to make God in our own image and let ourselves off the hook from anything that challenges us to do something different from what we want to do. It can be very appealing to try to use God for purposes other than the healing of our souls. That is the attitude that Jesus Christ rejected in today’s gospel reading. After describing how the Old Testament law required loving God “with all your heart, and with all your soul, and with all your strength, and with all your mind; and your neighbor as yourself,” the lawyer wanted to justify himself by narrowing down the types of people he had to love. That is why he asked “And who is my neighbor?” He wanted to limit what God required of him. That way, he could assume that he was a righteous man. The Lord’s parable does not, however, place any limits on what it means to love our neighbor. He tells us about a man who was robbed, severely beaten, and then left on the side of the road to die. Obviously, anyone who saw him in that condition would have an obligation to help him. All the more is that the case for the religious leaders who were going down that same road. They surely knew that the Old Testament law required them to care for a fellow Jew in a life-threatening situation. Like the lawyer, however, they must have come up with some excuse not to treat him as a neighbor. We do not know exactly what they were thinking, but they somehow justified passing by on the other side without helping him at all. 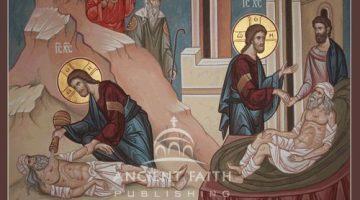 The Lord used the story of the Good Samaritan to teach us about what it means to share in His life. Purely out of compassionate, boundless love, Christ came to heal us from the self-imposed pain and misery that our sins have worked on our souls. He came to conquer our slavery to the fear of death, which is the wages of sin. 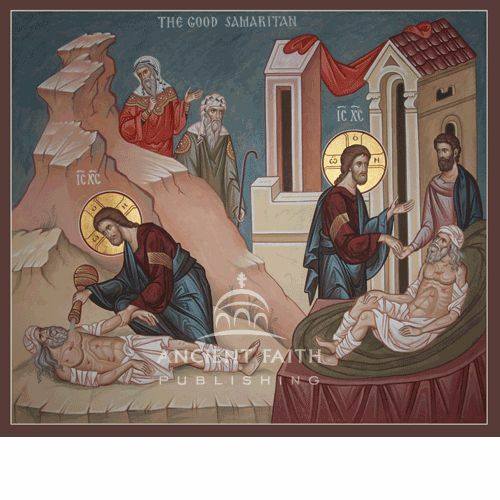 Like the Samaritan, He was despised and rejected. In the parable, the religious leaders were of no help to the man who was robbed, beaten, and left to die. They passed by and left him in the condition in which they found him. Likewise, the legalistic, hypocritical religious leaders who rejected the Messiah were of no spiritual benefit to those who needed healing from the ravages of sin. Laws can be interpreted and applied however someone sees fit, but they lack the power to heal anyone, much less to raise the dead. At their best, they tell us what to do, but still lack the power to enable us to obey them. Christ has brought salvation to the world, not by merely giving us a code of conduct, but by making us participants in His divine life by grace. By becoming fully human even as He remains fully divine, He has restored and fulfilled the basic human vocation to become like God in holiness. Only the God-Man could do that. If we are truly in communion with Him, then His boundless love must become characteristic of our lives. Among other things, that means gaining the strength to love our neighbors as ourselves by showing them mercy. Doing that even for those we love most in life is often difficult because our self-centeredness makes it hard to give anyone the same consideration we give ourselves. When it comes to particular people we do not like or to members of groups we perceive as threats or enemies, learning to love them as the Savior has loved us may seem impossibly hard. Here it is helpful to remember what the Samaritan in the parable did for the robbed and beaten man. He administered first aid, took him to an inn, paid the innkeeper to care for him, and promised to pay for any additional expenses when he returned. Christ does the same for us in baptism, the Eucharist, and the full sacramental life of the Church, which is a hospital for our recovery from the ravages of sin. Through the Church, He also calls us to spiritual disciplines that help us gain the strength to convey His mercy to our neighbors by loving them as we love ourselves. In order to be able to do that, we must seek healing and strength for a life in communion with Christ through the ministries of His Body, the Church. People who are recovering from severe injuries must cooperate with their physicians and therapists in order to become well. They must take their medicine and dedicate themselves to exercises, stretches, and other disciplines in order to regain health and function. We must approach the Christian life in a similar way in order to grow in our ability to manifest the Savior’s compassionate love to our neighbors. It is, of course, much easier to view the Church as simply a social club, a place of beauty, or where we go to feel better about ourselves. To think that way, however, makes us like the lawyer who tried to limit the requirement of loving his neighbors in order to justify himself. If we limit the significance of the Church to serving our desires, then we are trying to use God to get what we want. To do so is to fall into a dangerous form of self-centeredness that is blind to the true meaning of the Savior’s compassion. He makes us members of His Body in order to share His life with us, in order to perfect us in love in His image and likeness. He has come to heal us, but we must cooperate with His therapy if we are to grow in spiritual strength. Fr. Philip’s sermons continue to be a source of reflection and inspiration. Thank you for taking the time to prepare quality sermons every week and sharing them with all of us. They are a welcome alternative to much of what we see on the Orthodox internet today. Blessings! Many thanks for your kind message and words of support.